Don't miss our complete list of Charts and Tables with useful fastener information. 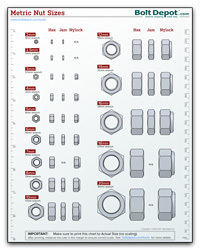 Also make sure to try our free Printable Fastener Tools. Bolt Depot began as J.T. Cazeault and Sons; a family-owned hardware store that opened in 1949. The store was located in an area with many automotive and marine repair shops. As a result the hardware store began stocking an unusually large selection of nuts and bolts. This included hard to find materials like brass and bronze. Soon the store earned a reputation on the South Shore of Boston for stocking a large variety of fasteners. In 1988 Jordan Cazeault, son of J.T. Cazeault took over the family business. Growing up in the hardware store Jordan was always fascinated by the endless variety of fasteners, and by how excited people were to find the right item. This led Jordan to further increase the fastener selection, and the store's reputation grew. In 1998 construction began on a big box hardware store only a mile down the street. Jordan knew that something would need to be done to make up for the expected loss of sales if the business was going to survive. He came up with an idea: BoltDepot.com. Jordan envisioned the website selling nuts and bolts using the same simple selection process he had developed over the years in the hardware store. The site would allow the store to sell its wide selection across the country. As the owner of a small hardware store the last thing you want to hear is that a big box store is opening less than a mile away. In the summer of 2000, Michael Åhs, a friend of Jordan’s, developed and launched the first Bolt Depot website. The site was custom built around Jordan’s method of walking customers through the process of finding the right fastener. The initial site was basic but users appreciated the easy navigation and Bolt Depot began to form a following of loyal customers. After the initial launch the Bolt Depot website was continuously updated with new features and additional products. Web business picked up steadily as hardware sales dropped off. As a result, despite a 50% drop in hardware sales no one was let go. As web sales exceeded all expectations it became necessary to close out the old hardware store aisle by aisle to make room for additional fasteners. By 2005 the hardware store was completely closed. Closing the hardware store was bittersweet. It was a huge part of my life since childhood, but Bolt Depot was an exciting new endeavor that was taking off. In 2016 the old hardware store just couldn't fit the large number of products now being stocked. A new, much larger warehouse was found in neighboring Hingham, and the move was completed in September 2016. Today Bolt Depot continues to offer the high standard of service set by the hardware store with highly knowledgeable, easy to reach customer service staff, a complete guarantee, and fast shipping. BoltDepot.com is continuously updated with new products and more information about fasteners while maintaining the straightforward navigation of the original site, making fastener shopping easy.